Drazin D, Shirzadi A, Jeswani S, Ching H, Rosner B, Rasouli A, Kim T, Pashman R, Johnson JP: Direct Surgical Repair of Spondylolysis in Athletes: Indications, Techniques, and Outcomes. Neurosurgical Focus 31 (5) :E9, 2011. Ghostine S, Perry E, Vaynman S, Raghavan R, Tong KA, Samudrala S, Johnson JP, Colohan ART: The Rare Case of an Intramedullary Cervical Spinal Cord Teratoma in an Elderly Adult: Case Report and Literature Review. Spine,15;34(26):E973-8, 2009. Mundwiler ML, Siddique K, Dym JM, Perri B, Johnson JP, Weisman MH. Complications of the spine in ankylosing spondylitis with a focus on deformity correction. Neurosurg Focus 24 (1): E6, 2008. Patel N, Wolcott P, Johnson JP, Cambron HO, Lewin M, McBride DQ, Batzdorf U:“Esophageal Injury Associated with Anterior Cervical Spine Surgery”. Surg Neurol. 2008 Jan;69(1):20-4. Villavicencio AT, Burneikene S, Pashman RS, Johnson, JP,: Spinal Artificial Disc Replacement: Cervical Arthroplasty; Part Il: History, Design, and Types of Artificial Discs. Contemporary Neurosurgery 29(12); June 15, 2007. Perri BR, Oyelese A, Bray RS, Johnson JP. “Classification of cervical kyphotic deformities: strategies and techniques for reconstruction surgery,” (submitted for publication). Samudarala S, Bergey DL, Pashman RS and Johnson JP: Pedicle subtraction osteotomy for cervical-thoracic kyphosis: a new approach. Submitted to Spine. Patel NP, Johnson JP: Minimally invasive sympathectomy. Submitted to Neurology. Gurian JH, Gobin YP, Johnson JP and Vinuela F: Balloon test occlusion of large radiculomedullary arteries prior to resection of vertebral tumors. Submitted to Journal of Neurosurgery. Bergey DL, Pashman RS and Johnson JP: Pedicle subtraction osteotomy for cervical-thoracic kyphosis: a new approach. Submitted to Spine. Wagner W, Regan JJ, Leary SP, Lanman TH, Johnson JP, Rao RK, Cossman D: Access strategies for revision or explantation of the Charité lumbar artificial disc replacement. Journal of Vascular Surgery, Dec;44(6):1266-72, 2006. Holly LT, Bloch O, Johnson JP: Evaluation of registration techniques for spinal image guidance. J Neurosurg: Spine 4(4)323-8, Apr 2006. Johnson JP, Stokes JK, Oskouian RJ, Choi WW, King W: Image-guided thoracoscopic spinal surgery: a merging of two technologies. Spine 30(19): E572-E578, October 2005. Villavicencio AT, Burneikiene S, Johnson JP: Spinal artificial disc replacement: lumbar arthroplasty. Part I. Contemporary Neurosurgery 27(19): September 30, 2005. 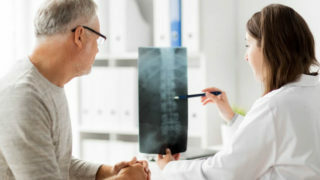 Villavicencio AT, Oskouian R, Roberson FC, Stokes JK, Park J and Johnson JP: Thoracolumbar vertebral reconstruction of metastatic spinal tumors: long-term outcomes. Neurosurg Focus 19(3):E8, September 2005. Oskouian RJ, Johnson JP: Endoscopic thoracic microdiscectomy. Neurosurg Focus18(3):E11, 1-8, March 2005. Johnson JP, Pashman RS, Lauryssen C, Anand N, Regan JJ, Bray RS: The changing role for neurosurgeons and the treatment spinal deformity. J Neurosurg Spine 2(3): 233-242, March 2005. Filler AG, Haynes J, Jordan SE, Prager J, Villablanca JP, Farahani K, McBride DQ, Tsuruda JS, Morisoli B, Batzdorf U, Johnson JP: Sciatica of non-disk origin and piriformis syndrome: diagnosis by MR neurography and interventional MRI with outcome study of resulting treatment. J Neurosurg Spine 2(2):99-115, Feb 2005. Johnson JP, Lauryssen C, Cambron HO, Pashman RS, Regan JJ, Anand N, Bray RS: Sagittal alignment and the Bryan Cervical Artificial Disc. Neurosurg Focus 17(6):E14, 2004. Oskouian RJ, Whitehill R, Samii A, Shaffrey ME, Johnson JP, Shaffrey CI: The future of spinal arthroplasty: a biomaterial perspective. Neurosurg Focus 17(3): E2, 2004. Geisler FH, Blumenthal SL, Guyer RD, McAfee PC, Regan JJ, Johnson JP, Mullin B: Neurological complications of lumbar artificial disc replacement and comparison of clinical results with those related to lumbar arthrodesis in the literature: results of a multicenter, prospective, randomized investigational device exemption study of the Charite intervertebral disc. J Neurosurg (Spine 2) 1: 143,154, 2004. Johnson JP, Patel NP: Uniportal and biportal endoscopic thoracic sympathectomy. Neurosurgery 51(5 suppl): 79-83, Nov 2002. Medin PM, Solberg TD, DeSalles AAF, Cagnon CH, Selch MT, Johnson JP, Smathers JB and Cosman ER: Investigations of a minimally invasive method for treatment of spinal malignancies with linac stereotactic radiation therapy: accuracy and animal studies. International Journal of Radiology Oncology Biological Physics 52(4):1111-1122, March 2002. Citow JS, Johnson JP, McBride DQ, and Ammirati M: Intraventricular neurocysticercosis: magnetic resonance imaging and surgical outcomes in 30 patients.Neurosurgical Focus 12(6): Article 6, 2002. Alsina GA, Johnson JP, McBride DQ, Rhoten PRL, Mehringer CM, Stokes JK: Spinal cysticercosis. Neurosurgical Focus 12(6): Article 8, 2002. Patel NP, Choi WW, Wright NM, McBride DQ, Johnson JP: Forestier’s disease associated with a retro-odontoid mass causing cervicomedullary compression. Journal of Neurosurgery (Spine 2) 96:188-194, 2002. Oskouian RJ, Johnson JP, Regan JR: Thoracoscopic Microdiscectomy. Neurosurgery50(1):103-109, Jan 2002. Stokes JK, Villavicencio AT, Liu PC, Bray RS, Johnson JP: Posterior atlantoaxial stabilization: a new alternative to C1-2 transarticular screws. Neurosurgical Focus 12(1): Article 6, January 2002. Oskouian RJ, Johnson JP: Vascular complications in anterior thoracolumbar spinal reconstruction. Journal of Neurosurgery: Spine 96:1-5, January 2002. Patel NP, Choi WW, Wright NM, McBride DQ, Johnson JP: Forestier’s Disease Associated with a Retro-odontoid mass causing cervicomedullary compression. Skull Base 11(Supplement 1): 2001. Holly LT, Bloch O, Obasi C, Johnson, JP: Anterior image guided spinal registration: a comparative accuracy study. Journal of Neurosurgery:Spine 95:196-201, October 2001. Bloch O, Holly LT, Johnson JP: Accuracy of image guided placement of C1-2 transarticular screws. Journal of Neurosurgery:Spine 95:74-79, July 2001. Kim KD, Johnson JP, Bloch O, Masciopinto JE: Computer-assisted thoracic pedicle screw placement: an in vitro feasibility study. Spine 26:360-364, 2001. Kim KD, Johnson JP, Bloch O, Masciopinto JE: Computer-assisted thoracic pedicle screw placement: an in vitro feasibility study. Spine 26(4):360-364, Feb 15 2001. Masciopinto JE, Johnson JP, Kim KD: Interbody fusion devices in infections. Techniques in Neurosurgery 7(2): 162-168, 2001. Johnson JP, Filler AG, McBride DQ: Endoscopic thoracic discectomy. Neurosurgical Focus 9 (4): Article 11, October 2000. Johnson JP, Filler AG, McBride DQ, Batzdorf U: Anterior cervical foraminotomy for unilateral radicular disease. Spine 25 (8):905-909, April 2000. Holly LT, Johnson JP, Masciopinto JE, Batzdorf U: Treatment of posttraumatic syringomyelia with extradural decompressive surgery. Neurosurg Focus 8(3): Article 8, 1-6, March 2000. Kim KD, Johnson JP, Masciopinto JE: Management of spinal epidural abscess and subdural empyema. Techniques in Neurosurgery 5(4):293-302, December 1999. Johnson JP, Obasi C, Hahn MS, Glatleider P: Endoscopic sympathectomy. Journal of Neurosurgery: Spine 91:90-97, 1999. Johnson JP, Obasi C, Hahn MS, Glatleider P: Endoscopic thoracic sympathectomy. Neurosurgical Focus 6(5) Article 2, May 1999. Kim KD, Johnson JP, Bloch O, Masciopinto JE, Saracen MJ, Villablanca JP: New software applications for interchangeable instrumentation in spinal stereotaxis. Stud Health Technol Inform (62):179-180, 1999. Kim KD, Johnson JP, Masciopinto JE, Bloch O, Saracen MJ, Villablanca JP: Universal calibration of surgical instruments for spinal stereotaxy. Neurosurgery44(1):173-178, January 1999. Batzdorf U, Klekamp J, Johnson JP: A critical appraisal of syrinx cavity shunting procedures. Journal of Neurosurgery 89(3):382-388, September 1998. Johnson JP, Paré LS, Torres RA: Thoracolumbar body replacement: materials and techniques. Contemporary Neurosurgery 20(6):1-9, March 1998. Johnson JP, Ahn SS, Choi WW, Masciopinto JE, Kim KD, Filler AG, DeSalles AAF: Thoracoscopic sympathectomy: techniques and outcomes. Neurosurgical Focus 4(2): Article 4, 1998. Johnson JP, Lane JM: Traumatic lumbar pseudomeningocele occurring with spina bifida occulta: a case report. Journal of Spinal Disorders 11(1):80-83, 1998. Johnson JP, Ahn SS: Thoracoscopic sympathectomy. Techniques in Neurosurgery3(4):308-314, 1997. Filler AG, Lufkin RB, Villablanca JP, Farahani K, Prager J, Johnson JP. MR Neurography and interventional MRI in diagnosis and treatment of sciatic from piriformis syndrome. European Radiology 7:1159-1160, 1997. Medin PM, Solberg TD, DeSalles AAF, Selch MT, Johnson JP, Smathers JB, Cosman ER: A minimally invasive method for fractionated spinal radiosurgery. Medical Physics24(6):972, 1997. Johnson JP: Anterior cervical foraminotomy approach. Journal of Neurosurgery85(3):525-526, 1996. Johnson JP, and Becker DP: A continuous microneurosurgical irrigation and suction system. Neurosurgery 39(3):409-411, 1996. Johnson JP, King WA, Andrews JC, Becker DP, Canalis R: Preserving hearing in acoustic neuroma removal. Western Journal of Medicine 159(1):72-73, 1993. Johnson JP, Alexander NJ: Hamster egg penetration: comparison of preincubation periods. Fertility and Sterility 41(4):599-609, 1984. Hirschel MD, Johnson JP, Alexander NJ: In vitro capacitation methods used in the hamster egg test. Fertility and Sterility 41(1):202-209, 1984.